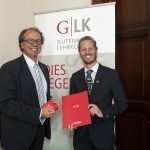 The presentation of the teaching offering during summer term 2019 is available here (German only). The presentation of the teaching offering during winter term 2018/19 is available here (in German only). The presentation of the teaching offering during summer term 2018 is available here (in German only). Sophie Burkhardt, scholarship student at the Institute of Computer Science, has received the Best Student Paper Award at the 8th IEEE International Conference on Big Knowledge (ICBK 2017) in Hefei, China, with her paper "Multi-Label Classification using Stacked Hierarchical Dirichlet Processes with Reduced Sampling Complexity", a result of collaborative research work with Prof. Stefan Kramer. The photo shows the proud award winner after receiving the award on 9 Aug 2017. Further information about this conference, including a list of accepted papers, can be found here . The presentation of the teaching offering during winter term 2017/18 is available here (in German only). Together with the Verein der Freunde der Informatik in Mainz e.V. and the Students’ Association the Institute of Computer Science hosts a barbecue on 6 July 2017. We have invited not only students and the members of the Institute and of the Verein der Freunde but also representatives of a couple of companies from the region who will hold short lectures about current projects. This is a good opportunity for students to get in touch both with professors and companies. The photo shows Prof. Kramer (centre) together with Associate Professor Eibe Frank (left) and Dean of Computing & Mathematical Sciences Professor Geoff Holmes. The presentation of the teaching offering during summer term 2017 is available here (in German only).